We are very satisfy to present this kitchen. Our clients wanted something special, avoiding the standard design. They wanted to have open elements and combine colours between white glossy and wood. The best choice we could offer to them was Arredo3 model Kalì White Maxxigloss and blonde oak with a push/pull mechanism to open the doors. 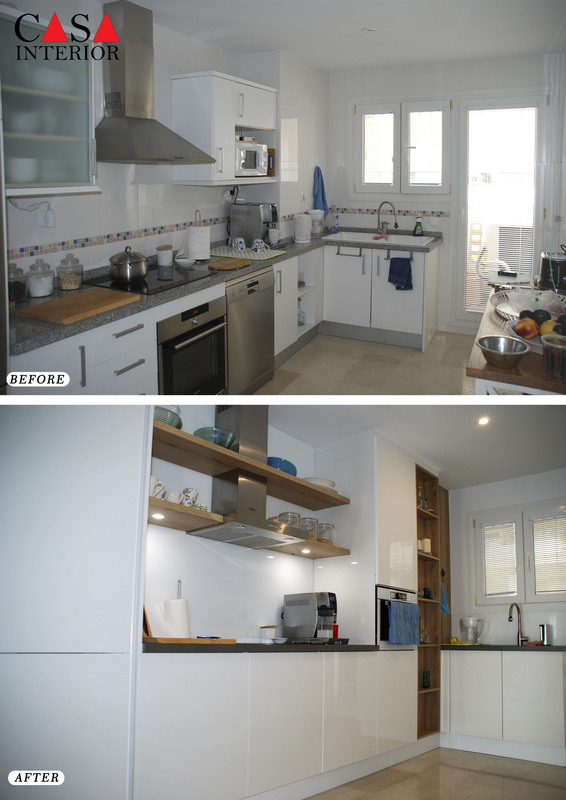 There are two tall units each side of the kitchen of 228 cm high. The integrated fridge is in the first column with a vertical gola lacquered in white because there is no fridge with a push / pull mechanism. It is a Whirlpool no frost fridge of 2 meters high with a huge capacity. The other tall unit has a oven / microwave of 45 cm high finish in white also from Whirlpool matching perfectly with the colour of the kitchen. Base units with push / pull system with 3 inside drawers each one of different high for cutlery, pots and pans. The third base unit is an integrated dishwasher from Siemens with open assist system which is opening pushing to the door as the other system. Above the base units there is an extractor, also from Whirlpool, with shelves in blonde oak. First shelves has integrated light supplied by Arredo3. The second shelves are tailor made around the extractor. 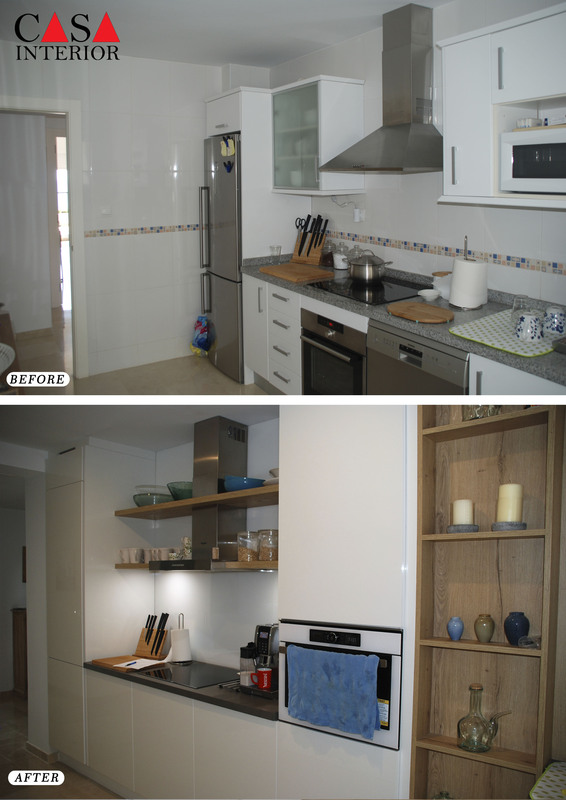 All back of the wall is covered with a white lacquered glass, fitted by our associates from Climavila, doing a great job. The other element in blonde oak is a tall open unit of 228 cm high which connects the cooking area and the sink area, with only 15 cm deep. 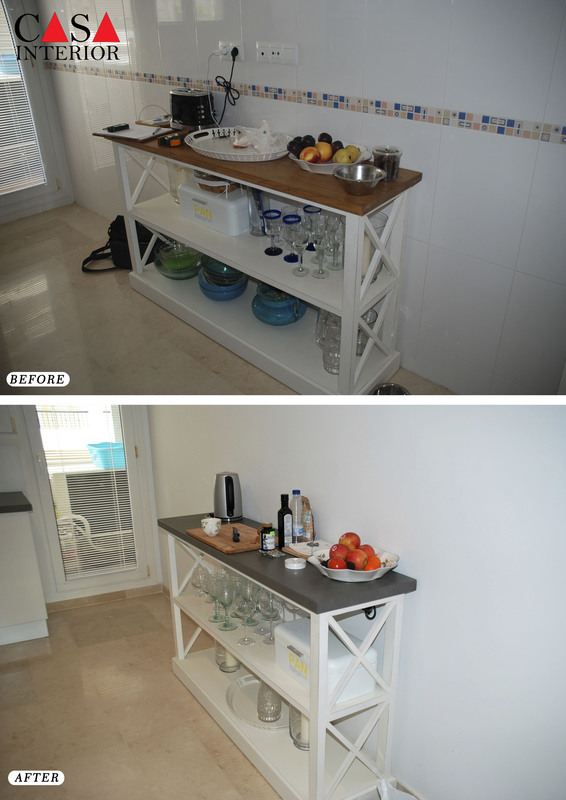 There is also a panel covering the side of the wall and maintaining harmony in the kitchen. The sink area is a base unit of 90 cm wide with two doors with the same push / pull system, an underneath sink of 50 cm in Polaris white Cristaldur Extreme with a tap in brushed stainless steel model Kavus by Schock and a splash back glass lacquered in white as the cooking area. 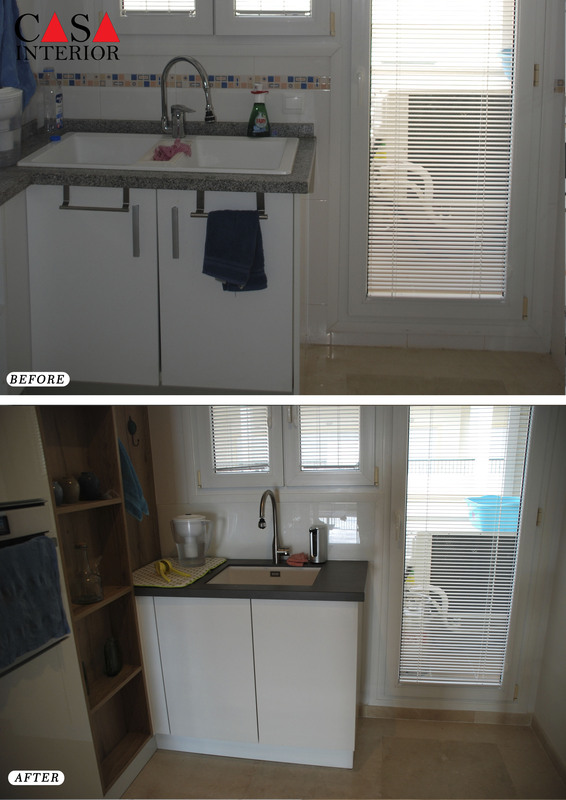 The side of the sink unit is also finish in white Maxxigloss. The worktop is made in Neolith Pietra Di Piombo, in 4 cm thickness, with 4 integrated sockets model Butterfly by Cucine Oggi. Two are in the cooking area and two in the auxiliar table in front of the cooking area, so they can connect all appliances and electrical devices they need. Contrast between white maxigloss, blonde oak and dark grey of the worktop works really good, giving a fantastic result. Thanks to our marble workers from TerraMarbre. Very grateful to our clients who trust in us to make this project a reality. You can keep watching more projects here or you can contact us to ask for a design.